Instant Pot Spaghetti with Meat Sauce - What's In The Pan? Instant Pot Spaghetti with Meat Sauce recipe has to be the easiest, most delicious thing I’ve made recently. 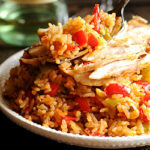 This crowd pleaser is so easy and tasty! And the best part is the everything but the noodles is made from scratch in one pot! Even the tastiest homemade spaghetti meat sauce. It’s our family favorite. By the way, it’s unbelievably easy to make your own spaghetti sauce. Much easier than you think. Do you have an pressure cooker? Or are you still on the fence about whether you really need one? I am now a huge advocate of the Instant Pot for making a busy life easier. One of the hardest parts about cooking for a family is that there are always a million things going on at once. Especially when you have kids. You need some help to get dinner on the table. How do I do it with young kids? I use my Instant Pot and my slow cooker. Almost every day. I make Instant Pot Chicken and Rice and Instant Pot Cheesecake regularly. Pressure cooking allows me to spend less time in the kitchen and more time with my family. 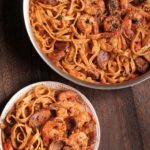 You will love Instant Pot Spaghetti! Bellies will get full, everyone will be happy, and you’ll be so glad you found this quick Instant Pot Spaghetti recipe to add to your rotation! Once you get the spaghetti ingredients prepped and into your Instant Pot, the work of dinner is done. You’ll set it and forget it. Then spaghetti dinner is served! If you are looking for a great first recipe for your pressure cooker, this Instant Pot Spaghetti with Homemade Meat Sauce recipe is an easy and balanced meal that your family will love! All you need to make Instant Pot Spaghetti is ground beef, mushrooms, broth, crushed tomatoes, spices and pasta! I recommend having all of your ingredients out before you start cooking. Chop the onion and garlic. And slice the mushrooms. Get your spaghetti out. Open your canned tomatoes. You’ll use the saute mode on your Instant Pot to soften the veggies. It takes the Instant Pot a few minutes to heat up on saute mode. Once it does the pot gets pretty hot so you won’t have a lot of extra time to prep ingredients. After the onions and mushrooms have softened a bit, you’ll stir in the garlic and add beef. Stir ground beef as it cooks and then add tomatoes. Next, you’ll stir in the broth and then add the pasta on top. Be sure to stir in the broth well and make sure to scrape all the bits of food from the bottom of the pot. As you may know, this could cause you to get a burn warning once you start pressure cooking. You will use “Pressure Cook”/”Manual” button. As a reminder, the digital display has 2 options. High and Low. We are using High. First thing first, you will turn the venting knob on top of the lid all the way to the back to “Sealing” portion. Next you will set time to 8 minutes or 00:08. At this time the pressure will start building. This is called preheat mode. This process will take a while, about 10-15 minutes due to so much liquid in the pot. Once the instant pot is getting close to reaching its optimal temperature, you will see steam coming out of the float valve. The screen will show “On” for the duration of the preheat mode. But it’s not cooking at this point yet. You will know when the preheat mode is over when the float valve pops up and seals itself. Also, the steam will stop coming out. At this time you will hear the beep. Also “On” reading on the screen will be replaced by “00:08”. This will start the countdown from 8 minutes until 0. Once the countdown is over, the Instant Pot will beep several times. The digital display will show “L0:00”. Push “Cancel” button to turn off heat warm mode. Now let’s make sure that Instant Pot is depressurized before opening it. We will be using NPR, or Natural Pressure Release method. First, wait until the Floating Valve (metal pin) completely drops before opening the lid. It takes about 10 minutes. Second, you will turn the Venting Knob from “Sealing” to “Venting”. This will ensure that all the pressure is released before opening the lid (about 5-10 minutes). Lastly, you will open the lid. If you are using your Instant Pot for a variety of recipes, it’s a good idea to have 2 different rings. One for savory recipes and the other for sweet recipes. This helps to avoid odor exchange. I use this Genuine Instant Pot Ring as my second ring. I also like to use a glass lid when I simply need to keep food warm. Instant Pot Tempered Glass Lid is a good way to do so. Pin this Instant Pot Spaghetti with Meat Sauce Recipe to your Main Dish Pinterest Board! 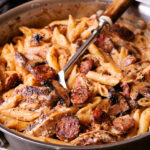 You might also like these easy to follow Instant Pot recipes: Instant Pot Country Style Pork Ribs, Instant Pot Mashed Potatoes and Instant Pot Spatchcock Chicken. How about an Instant Pot Dessert? Try this amazing Instant Pot Apple Cinnamon Cake! This Instant Pot Spaghetti with Meat Sauce recipe is an easy and balanced meal that your family will love! Push "Sauté" button and "Normal" speed on the Instant Pot. Add 1 tbsp olive oil, garlic, onion (or shallot) and mushrooms. Sauté on Normal for 5-7 minutes with no lid on, stirring with a wooden spoon. If, during sautéing process, your instant pot signals "Burn', just add as splash of water. Add second tablespoon of olive oil and ground beef. Season with 1/2 tsp salt. Sauté on high for 5-8 minutes, breaking down beef with a wooden spoon. Add crushed tomatoes, diced tomatoes, remaining 1/2 tsp salt, chicken stock, onion powder, garlic powder, pepper and Italian seasoning. Combine everything with mushrooms and shallots by mixing with a wooden spoon. Add 8 oz spaghetti, breaking them by half (make sure to break them to prevent pasta from clumping during pressure cooking). Place spaghetti in layers,crosswise, alternating directions - this will prevent clumping as well. Turn the vent on top of the lid all the way to the back to "Sealing". Click "Pressure Cook"/"Manual" button. Set it on High. Set time to 8 minutes. At this time the pressure will start building (this is called preheat mode). This process will take a while, about 10-15 minutes due to so much liquid in the pot. Once the instant pot is getting close to reaching its optimal temperature, you will see steam coming out of the float valve The screen will show "On" for the duration of the preheat mode. It's not cooking at this point yet. You will know when the preheat mode is over when the float valve pops up and seals itself. The steam will stop coming out. At this time you will hear the beep, "On" reading on the screen will be replaced by "00:08", which is the number of minutes. This will start the countdown from 8 minutes until 0. Once the countdown is over, the Instant Pot will beep several times and the digital display will show "L0:00". Push "Cancel" button to turn off heat warm mode. Last step is to make sure the Instant Pot is depressurized before opening the pot. We will be using NPR - Natural Pressure Release method. After the cooking cycle of the Instant Pot Spaghetti is finished, there are a couple of things that need to be done prior to opening the lid. Second, turn the Venting Knob from "Sealing" to "Venting" to ensure all the pressure is released before opening the lid (about 5-10 minutes). Note: If you see steam coming out during pressure cooking, don't panic. This is perfectly normal. It would be the same amount of time without spaghetti. 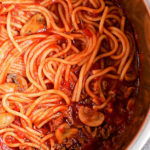 Thank you for your recipe using homemade spaghetti sauce rather than a jar of sauce. I have made my spaghetti sauce in the Instant Pot but I’ve never included the pasta before. I was unsure of the ratio of liquid (including sauce) to the dry spaghetti noodles. I had approximately 2 cups of sauce & added 1 1/2 cups of chicken broth then put 5.5 ounces of noodles on top, made sure they were immersed before sealing the pot closed & manually setting to cook for 8 minutes. Let it do NR for 10 minutes, opened & stirred. It was delicious, both my husband & I enjoyed it! Thank you for giving me the guidance to proceed, the suggestions of amounts and times, I will be making this again. Donna, I really appreciate your kind words and sharing your experience! How come you use chicken broth instead of beef? Just seems to me with ground beef, you would use beef broth Can’t wait to try this, looks like so much less sodium than jarred sauce. It’s just a personal preference – I like the flavor of the chicken stock better as well as the smell:). Beef stock’s smell is too strong for me. I’m glad you noticed that it’s much less sodium! Sounds great! I am going to try it. You should add a video of it on your YouTube channel. Olya, I am going to try this tonight. We have Cori’s kids today and will be going back-and-forth,…me for a while, Cline for a while, etc. This looks like it would work perfectly! Yes, it’s perfect for on the go. We made it in a hotel room and ate it all weekend. I had to make it tonight! 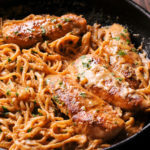 I’ve made spaghetti in the Instant Pot before, but with the jarred sauce. This was much better than that. Thank you!